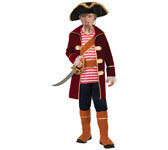 Child pirate costume - Pirate Captain. Hat, Top with shoulder strap, Belt, Jacket, Pants, Boot top shoe covers. Costume of high quality with attention to detail. Size: MEDIUM (size: 8-10,for 5-7 years old) and LARGE (size: 12-14,for 8-10 years old). Material content: 100% Polyester, exclusive of decoration.